The Executive Order calls for the reduction of greenhouse gas emissions across federal operations by at least 40 percent through 2025 through a broad host of measures, including building energy conservation, energy procurement inclusive of renewable thermal technology, and fleet management. Coeur d’Alene, Idaho has been the place to be this week for the Forest Products industry with over 250 people gathering for the biennial event. For the first time, the Small Log Conference included a focus on the pellet industry and an opportunity for those of us in the pellet world to share some insights on the market and industry drivers. PFI was pleased to participate in the conference as a sponsor and exhibitor. It was my pleasure to moderate a panel on the various end uses of pellets, featuring speakers Rob Mager (Ontario Power Generation), Mark Faehner (American Wood Fibers) and Randy Brooks (University of Idaho). A second panel highlighted opportunities in the export pellet market for western U.S. manufacturers, including a glance at Japanese market capabilities. Tim Portz of Pellet Mill Magazine gave a detailed look at global market dynamics driving pellet production and capacity growth. Professor Han Sup Han of Humboldt State University (HSU) and principal investigator of the Waste to Wisdom project, a $5.8 million grant through the U.S. Department of Energy, introduced attendees to the initiative which seeks to find the most effective outputs for forest residuals using a variety of conversion technologies. PFI is one of several organizations working on this initiative with Dr. Han and his colleagues at HSU. The project’s website is set to launch in the next several weeks and we’ll share that information with you when it’s available. While in Idaho, I had the chance to tour two PFI member pellet manufacturing facilities: the North Idaho Energy Logs (Clark Fairchild, pictured) plant in Hauser, Idaho, which was part of the larger conference tour, and a visit to Lignetics' Sand Point facility. Finally, a highlight of the conference was a presentation from keynote speaker Bruce Ward of Choose Outdoors, who reiterated the conference’s underlying theme: the need for the forest products industry to expand its conversation beyond an internal dialogue and find effective ways to reach global audiences about the benefits of wood and wood energy. We’ll be hearing more on that from conference organizers, Forest Business Network, in the coming months. If you’d like to learn more information on the Small Log Conference, click here. The PFI Annual Conference highlights the most timely and significant issues impacting the pellet industry. Join colleagues from the public and private sectors, academia, and local, state and national governments from North America and beyond for this can't miss event featuring two days of educational sessions, industry exhibits and extensive networking opportunities. The conference will be held at the Williamsburg Lodge in Williamsburg, VA., July 19-21. Planning is well underway and we’ll be opening registration soon. If you plan to attend the conference, you are encouraged to reserve your hotel room now at the PFI preferred rate. More information can be found here. In addition to its luxury accommodations and premier meeting space, Williamsburg is easily accessible from the Richmond, VA airport and offers tons of family-friendly activities. We’ll continue to update you on the conference via the Pellet Wire and other communications. If you aren’t a member of PFI and want to take advantage of the numerous benefits PFI membership offers, please visit our website for more information. And, we encourage you to contact PFI staff to find out how PFI membership can benefit your business. There are many opportunities to utilize PFI’s extensive outreach to get your company’s name in front of current and potential customers. Advertise in Pellet Wire, PFI’s weekly newsletter, or Pellet Times, PFI’s members-only once monthly in-depth newsletter. Ad placements run for six months and cost between $250 and $750 – a great value. Become a Platinum, Gold or Silver Sponsor. These year-long sponsorship packages include advertising as well as participation in PFI’s Annual Conference. Advertise on our website. There are many choices for prominent placement on PFI’s well visited website. Learn more by visiting PFI’s webpage on advertising opportunities. POST FALLS - Area forest products professionals are cautiously optimistic - knock on wood - about the outlook of their industry in 2015. 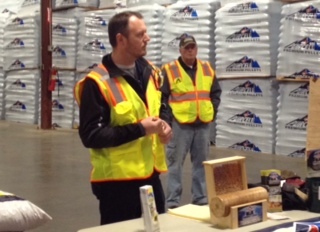 "We've seen a nice improvement from even a couple years ago," said Craig Rawlings, president and CEO of the Forest Business Network, while touring the Purcell Premium Pellets mill north of Post Falls on Tuesday. Housing starts nationally have gradually increased since hitting bottom at 544,000 in 2009 during the recession, Rawlings said. Starts were at 924,900 in 2013 and nearly 1 million in 2014. The increase bodes well for the lumber industry, Rawlings said. Over the past several decades, controlling wood pellet quality for foreign and domestic residential heating markets has been very challenging. For nearly as long as there have been residential wood pellet burning appliances, there has been the knowledge that not just any pellet will yield the best performance of the appliance. Wood pellet burning appliances require fuel that is very consistent in properties such as moisture content, density, and dimensions such as length and diameter to yield well-balanced combustion for a clean and consistent burn. In addition, the pellets must be low in fines and durable to prevent the creation of fines in handling.